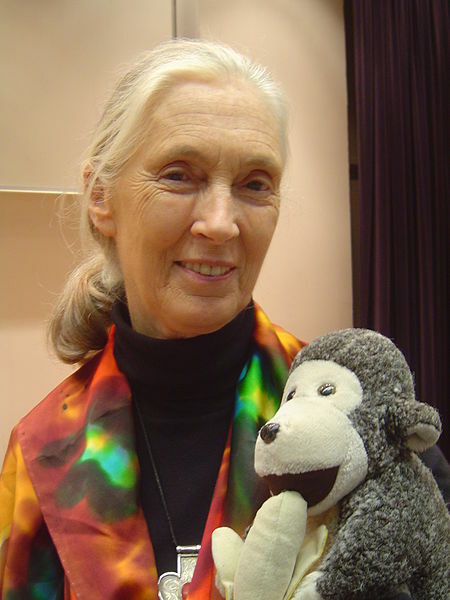 This week’s Dodo Pad diary and Acad-Pad feature the birthday of primatologist Dr. Jane Goodall, who was born April 3, 1934. Happy Birthday Dr. Goodall! Dr. Jane Goodall is a truly remarkable woman and an amazingly accomplished scientist. Her work with chimpanzees not only revolutionised the way we view these great apes, but also made us question the very definition of what it means to be human. At age 23, with no scientific background and no university degree, young Jane was given the assignment by her employer and mentor anthropologist Louis Leakey to observe chimpanzees in the Gombe Stream Reserve in Tanzania. During her many years of direct observation of chimpanzees in the wild, Jane discovered behaviour never before seen in chimps such as tool use, meat eating and social hierarchy displays. How extraordinary! Jane earned her Ph.D. in Ethology at Cambridge University in 1965, one of only 8 students the university ever admitted to the Ph.D. programme without previously having earned an undergraduate degree. She has written books, made television documentaries and films, and received numerous awards for her outstanding work. Today Dr. Goodall continues her wonderful work with the Jane Goodall Institute, which works in Africa in chimpanzee research and conservation, and in community-based conservation and development to improve the lives of people in environmentally-conscious ways. So let us all wish Dr. Goodall a very happy birthday, and many more years of excellent work! Meanwhile here at Dodo Towers, we are all dreadfully excited! Our new Acad-Pads for the 2010/ 2011 academic year will be available very soon and we have all been busy bees getting them ready for your enjoyment. Stay tuned to Miss Peabody Writes for more information which will be forthcoming very, very soon!